This Ruby on Rails sample application is inspired by the Rapid Response Kit, built by Twilio and used all over the world by organizations who need to act quickly in disastrous situations. We use the Twilio Ruby library to generate some TwiML that tells Twilio to Dial into a Conference that we're naming RapidResponseRoom. This means that anyone who calls your Twilio number will automatically join this conference. When the caller finishes entering digits Twilio makes a GET or POST request to this URL including a Digits parameter with the number our caller chose. We use that parameter to set a couple variables, isMuted and canControlConferenceOnEnter, which we then use to configure our Dial and Conference TwiML elements. That's it for connecting callers to our conference room. Let's explore next the other feature of this app: broadcasting a voice message to a list of phone numbers. In order to use Twilio's handy API we need to first create our Twilio client, which we can easily do by passing our credentials. Since we are going to use @client a bit we will set it in a shared filter that is called before every action that needs it. Here we Say something to the caller and then Record her message. There are many more options we can pass to Record, but here we simply tell it to stop recording when * is pressed. This controller processes our voice broadcast webform, starting with the phone numbers our organizer provided. Because they are comma separated we can use Ruby's CSV class to parse them. 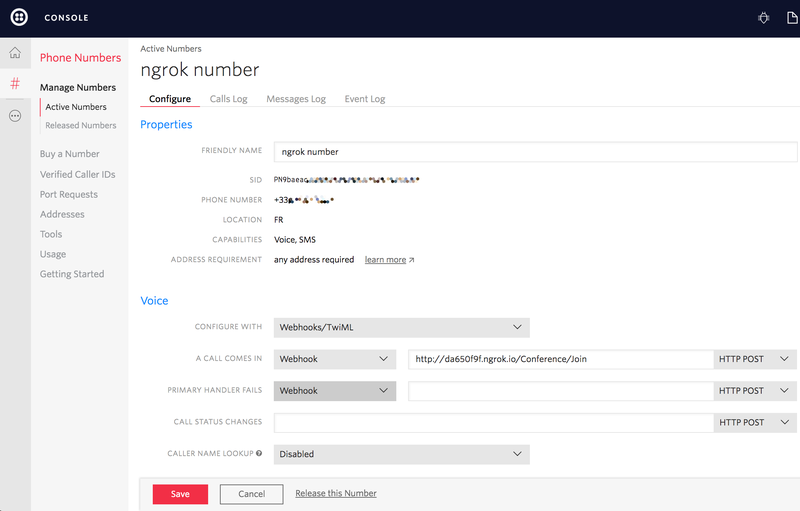 When Twilio connects this call it will make a request to the Url parameter to get further instructions. We include a recordingUrl parameter in that URL so that our Play action method will know which recording to use. Instantly collect structured data from your users with a survey conducted over a voice call or SMS text messages. Learn how to create your own survey in Rails. Create a fully functional automated phone tree, with some Reese's Pieces sprinkled about.